I’ve been using and testing this stock for two months now and it’s now my preferred stock for any AR I own. Many shooters see assorted buffers advertised on various websites but many of these buffers are just ideas without any scientific design. The MGI buffer has been designed by engineers for optimum effectiveness in reducing recoil and rate of fire on semi or full auto AR’s. This buffer does everything it claims! Simply I’ve fired many 100’s of rounds from my 14.5 inch CMMG Carbine and this buffer will stay in this AR and any other I acquire. The buffer also comes with a “D” ring which fits over the spring of the extractor. It’s called the “D-Fender”. 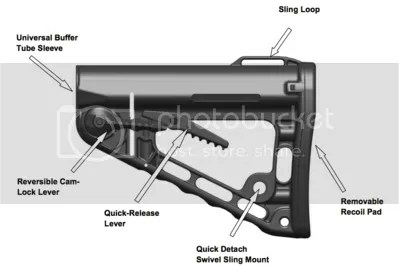 It’s function is to increase extraction reliability and ejection force by a factor of 4X. A picture is shown below. It also works as advertised whether the rifle is very dirty of freashly cleaned. I’ve tried just about every buffer on the market with mixed results. The MGI buffer made me a believer. Here’s how it works. The buffer body is a fairly lightweight steel with the base housing a spring loaded tip. Internally there are three Tungsten cylinders. As the weapon is fired the bolt moves to the rear againest the buffer body which in turn moves rearward under spring pressure. The Tungsten cylinders move forward againest the rearward pressure. Since there are three cylinders each one moves forward againest the rearward pressure slightly seperated. At the end of the recoil stroke all three cylinders have struck each other and stopped forward motion when the bolt has compressed the internal spring. The bolt then moves forward with the process reversed and the Tungsten cylinders moving to the rear. 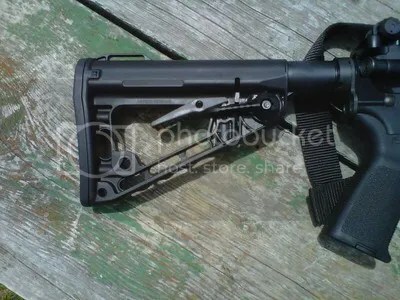 As I mentioned the rear of the buffer has a sturdy tip that is spring loaded and aids in this recoil reduction process. 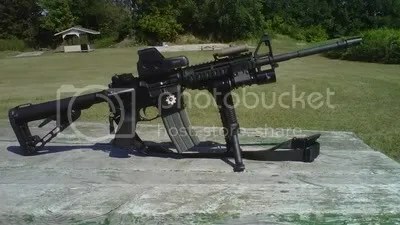 This also makes the buffer very reliable in function and in my opinion increases the reliability of the rifle. A simple way to look at it is taking two hammers and swinging them together one in the right hand one in the left. When they meet they cancel each others energy. When I first got this buffer I installed it which of course took all of two minutes. I also installed the D-Fender over the extractor spring. I went to the range with the usual 55 grain plinking ammo. I could feel the difference in recoil with the first round fired. As I continued firing rounds I admit I got a bit of a smile on my face after finally finding a buffer that works! The price is higher than most but to me it’s worth the money. When I fired about 100 rounds I decided to shoot some rapid fire to see just how effective the reduced recoil was at allowing me to shoot double taps into a small area without having to pause and re-sight using the EoTech 516. As it turned out I was able to fire my first round where I wanted it then not loose sight of the red dot and almost immediately fire my second round placing it within two inches of the first at 50 yards. Using the bipod the rifle moved very little allowing smaller groups than the first that were fired standing unsupported. The buffer is also self regulating so that any AR platform in any caliber is compatible. The rate of fire reduction is somewhat dependent on barrel length. With the D-Fender installed my ejected rounds were going approximately twice the distance they had been as well as landing in a 2 foot circle. I feel certain the buffer will also reduce the wear and tear on your rifle as well. Currently the buffer is being used by a number of law enforcement agancies as is the D-Fender. I would also expect the military to take an interest in these excellent additions to the M4. In a war zone any device which increases reliablity and accuracy is a big plus for any soldier or Marine. I recommend this buffer and D-Fender ring without reservation of any kind. Detonics has created an upgrade kit that will fit standard 1911’s as well as the older Detonics Combat Masters. As I understand it this kit includes all that is needed to complete the upgrade. Listed below are the parts included in the kit. The Detonics Combat Master Upgrade Kit includes everything you need to put right on your 1911 style frame. Unlike other 1911 uppers, this includes all required parts, including: barrel, barrel link pin, barrel link set, extractor, guide rod, firing pin, firing pin spring, firing pin stop, front and rear sights installed, reverse plug, recoil spring set, and slide. Available for Pre-Order immediately in the store. The kits are in production and will be available soon. From the information I have the kit will be in .40 cal. No .45acp’s will be offered. The magazines will be $35 and $40 depending on caliber and size. Detonics magazines will be available separately from Detonics website. I would have added pictures but the website does not allow copy and paste of any photos.